Google To Go After Facebook With Google Me? In less than 140 characters, a firestorm erupted. Could it be that Google just might be turning its attention to social networking officially? 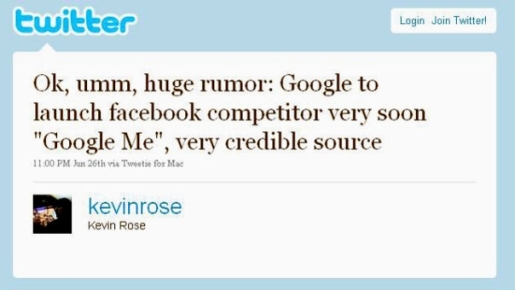 Kevin Rose, the founder of Digg and the website owner’s best friend, says that they are. You can see a screencap of the Tweet above! If anyone has his ear to the ground when it comes to new rumors and developments amongst Silicon Valley’s elite, it’s Rose. Is Google developing a Facebook killer? Google has poked at social networking before, thanks to Google Buzz and Google Latitude, and they’re not afraid to take on powerful competition. They also own Orkut, a social networking site popular internationally, but not popular in the US. If they merged Latitude, Buzz, Orkut, Google Wave, Google Profiles, and all the other Google products? They’d have a perfect social networking engine that’s way more useful than Facebook could ever hope to be. The big problem is inertia. People are already on Facebook; they’re not going to abandon it until their friends do. I mean, people still use MySpace, AOL, and Internet Explorer, for crying out loud! However, there’s always room for more than one social network in a person’s life, and since most people use Google Everything, well… it’s easier to win over converts.